This weekend, on 22 March, Macedonian citizens will go to the polls to elect a new president and new local governments. The vote will take place under the close monitoring of the international community. Macedonia had better do well. The Macedonian government said the local and presidential elections are held at the same time for cost-saving reasons. The unintended consequence of this decision is that the presidential vote has completely eclipsed the local one. Most attention has been focused on the candidates for president. The candidate of the ruling party, The Internal Macedonian Revolutionary Organization (VMRO), Gjorgji Ivanov, is leading in the polls with quite an advantage over the second-ranked candidate of the opposition social democrats, the Social Democratic Union of Macedonia (SDSM), Ljubomir Frckoski, but surprises in the second round are, nevertheless, possible. However, the most important thing for the country right now is not the election result; it is the electoral process. Macedonia is under strong pressure from the international community to organize free and fair elections. This is, at present, the foremost condition for the country's international integration. If Macedonia runs a good election, it might hope to get a date to start accession talks with the EU - and visa liberalization - perhaps by the end of 2009. But if the election doesn't go well, Macedonia can forget about it. This imperative has been repeated so many times lately that everyone in the country, even the birds in trees, has learned it by heart. A few days ago, the religious communities in the country made a joint appeal to politicians to make sure elections were free and fair. When presidential candidates met last week in Tetovo for a breakfast and 'greet the press' meeting, the cook at the restaurant, speaking to reporters, described the "European" menu he had prepared for the politicians and expressed his desire for "free and fair" elections. Macedonia is, it can be said without exaggeration, in a "free and fair" frenzy. Nevertheless, the fact that everyone knows it and wants it does not mean it will actually happen. It remains to be seen whether outspoken awareness will result in actual behavioral change. Last year's early national vote was a disgrace for the country. It was marred by irregularities and violence - serious violence. There was even a shootout with automatic weapons in front of a ballot post in Čair, a municipality in the capital, Skopje. Some of the electoral "combatants" ended up with serious injuries. It was the final blow to Macedonia's chance for getting a date to start negotiations with the EU. The European Commission's report on Macedonia's progress was unusually blunt - "Macedonia does not meet democratic standards," it concluded. Ever since last year's electoral disaster, international pressure on the country has mounted: Macedonia must show it has the democratic capacity to run a smooth election or its integration prospects could be put on hold indefinitely. It is a shame. Macedonia is probably the last remaining country in the region still dealing with such challenges. A good indicator is the number of observers the OSCE is sending to monitor the vote. Whereas some of Macedonia's neighbors get a handful of monitors who come in for a nice weekend outing, Skopje receives an army of well-trained and alert observers who are dispatched to all areas of the country. This year, around 340 of them are coming. Last year, there were 270. According to some comparisons, Belarus is the only other country in Europe which gets that many observers. Why can't Macedonia run a decent election? The answer probably lies in the level of its political culture. By now it has been recognized that, rather than individual citizens, the political parties are responsible for election irregularities. People who engage in violence, intimidate voters, vandalize or "stuff" ballot boxes or even pull weapons do it upon command from their party headquarters. When the parties stop issuing such commands, violence will stop. The government has seriously tightened legislation on election misconduct and hard prison time awaits those who are convicted of electoral violence. The number of convictions has been on the rise. Still, out of around 200 people charged with last year's election incidents, only about ten percent of them have been convicted. However, the opposition alleges that the number of sentences is much greater in their camp. As it appears, there is some truth to this claim. It could be that the message is slowly getting across. After last year's national vote, the Democratic Party of the Albanians (DPA), led by Menduh Taci, which was widely perceived as a major culprit in the election sham, fell out of favour with its (former) coalition partner, the VMRO, and lost power. Within months, it lost a relevant part of its constituency when a splinter party led by Imer Selmani, former Minister of Health, seceded. Mr. Selmani, who, at least for the time being, seems to be one of the most likeable politicians the country has ever had, is currently running for president. Mr. Selmani says Macedonia is ready to elect an ethnic Albanian for president. That might be too much to hope for, although it is sure that Selmani will have many Macedonians voting for him. However, if he makes it into the second round, all bets will be on. Most of the serious electoral wrongdoing happens in the Albanian camp, but in a limited and consistent number of polling districts. 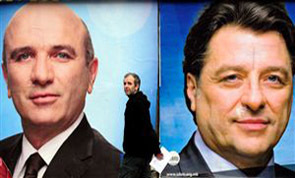 The two major parties of the ethnic Albanians, the Democratic Union of Integration (DUI) of the former guerilla leader Ali Ahmeti and the DPA of Menduh Taci, are sworn enemies. Nevertheless, the excessive partisan antagonism which engulfs political life is equally typical of all Macedonian political parties. The two biggest parties in the Macedonian camp, the ruling VMRO and the opposition, SDSM, are also completely antagonistic. The level of sheer revulsion they feel toward one another is beyond control. It seems to run so deep that they are actually unable to talk, to confront each other constructively, exchange views or debate. The communication they engage in usually consists of insults and accusations. Actually, their communication style better resembles that of rival gangs of football fans than that of political parties. By now it is difficult to imagine that the leader of the VMRO, current Prime Minister Nikola Gruevski, and the incoming leader of SDSM, out-going President Branko Crvenkovski, could sit down and confront each other in an open debate. One has the impression that they probably could not stand to be in the same room together. One expects politics to be about polarization and antagonism. Brussels' demand for warm, Jacuzzi-style politics in Macedonia in which everybody sits together, kindly conciliates and just gets along is also a bit, well, idealistic. But it is also true that political enmity in the country has reached, or rather sunk to, a new level of destruction. It is this hate which erupts in violence at election time. Some say this is a disease of young democracy. A candidate for mayor pulled out the adage that "democracy is like English grass: it needs lots of water and two hundred years." Well, Macedonia does not have that long. It needs to deliver this weekend.